Giusti Dichroic Glass Green Lilly Earrings with Silver Loops. 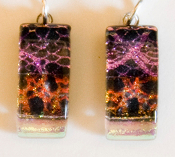 These Earrings come in three other dichroic colors, Yellow, Pink and Blue. 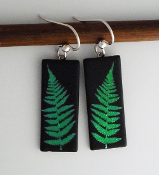 Giusti Green Fern Dichroic glass Earrings with Silver Loops. These earrings come in three other dichric colors, Yellow, Pink and Blue. 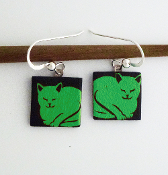 Green Cat Giusti Dichroic Glass Earrings with Silver Loops. These earrings come in three other dichroic glass colors, yellow, pink and blue. Giusti Green Dichroic Glass Fuchsia Earrings with Silver Loops. These earrings come in three other dichric colors, Yellow, Pink and Blue. 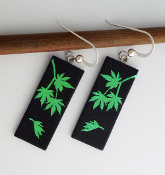 Green Dichroic Glass Japanese Maple Earrings with Silver Loops. These earrings come in three other dichric colors, Yellow, Pink and Blue. 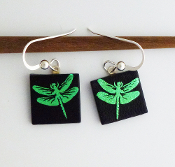 Green Dragonfly Giusti Dichroic Glass Earrings with Silver Loops. These earrings come in three other dichroic glass colors, yellow, pink and blue. Green Gingko Giusti Dichroic Glass Earrings with Silver Loops. These earrings come in three other dichroic glass colors, yellow, pink and blue. 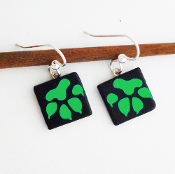 Green Paw Giusti Dichroic Glass Earrings with Silver Loops. These earrings come in three other dichroic glass colors, yellow, pink and blue. Pink Cat Giusti Dichroic Glass Earrings with Silver Loops. These earrings come in three other dichroic glass colors, yellow, green and blue.